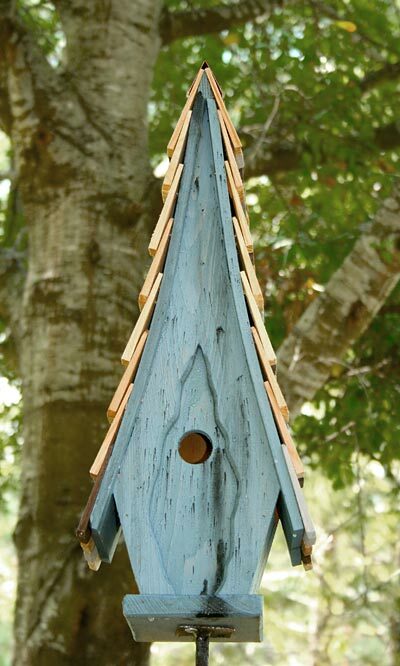 Elevate the rustic look of your bird garden using the Heartwood Blue High Cotton Bird House. Placing this eye-catching shelter in your yard will delight any visitor and add bold architecture to the area. The extended, steeply pitched roof creates a whimsical silhouette, with multicolored shingles lending dimension to the piece. The vivid blue hue of the house itself adds more color to your area, and its weathered finish brings antique charm. A 1.25" diameter entry hole rests in the center of the house, slightly recessed from the front of the unit in a faux knot. This entry is perfect for small songbirds, and the wide base of the house offers plenty of room for an avian family. The all-wood home easily protects birds from the elements, and a cleanout panel on the back allows for seasonal maintenance. A band of copper flashing at the top of the roof completes the look. Place this roost on a pole or post using a mounting bracket (not included) for versatile positioning. Enhance your bird sanctuary with the Blue High Cotton Bird House. Made in the USA.